Even with the convenience of Pinterest at our fingertips whenever and wherever we want it, I still think there's something about flipping through actual pages of a great design book or shelter magazine. 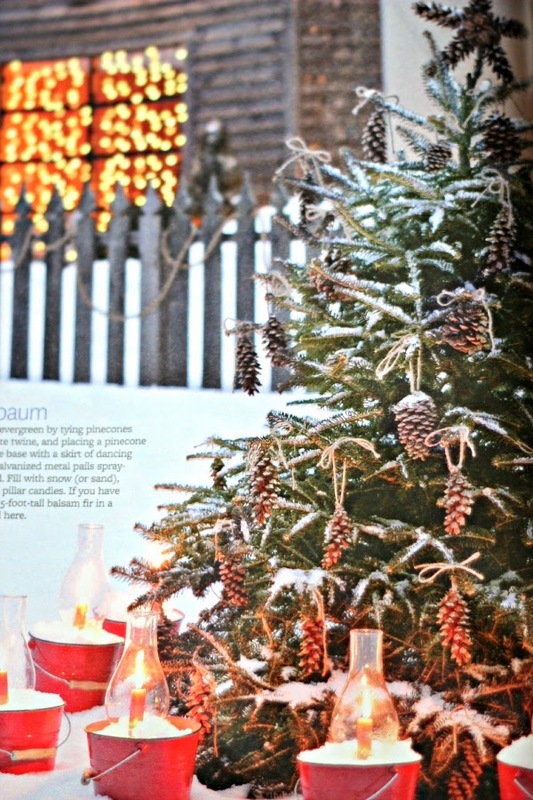 There is so much I love about this photo, but the candles with the "snow" around them caught my eye. I decided to adapt this idea and do a grouping of candles on my dining room table. I used a little snow, also, in the big candleholders flanking the tray. 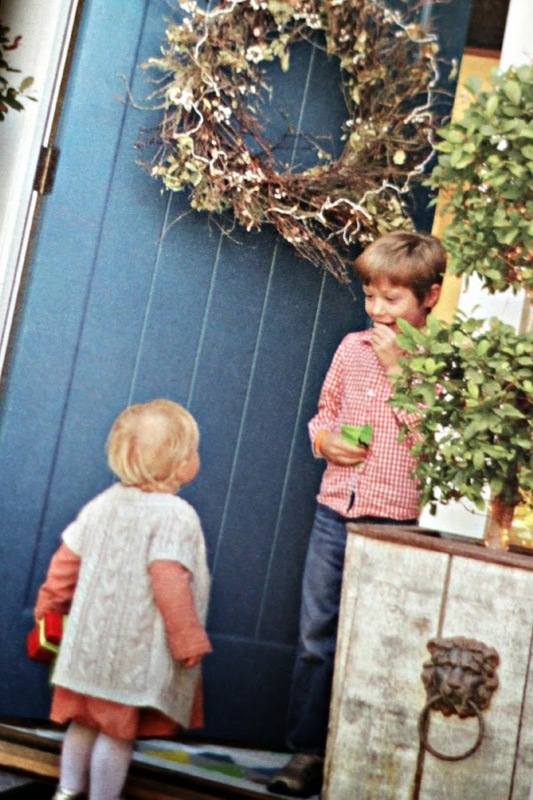 I'm probably not through with this image, though, there is so much good stuff there (those hanging lanterns!!). 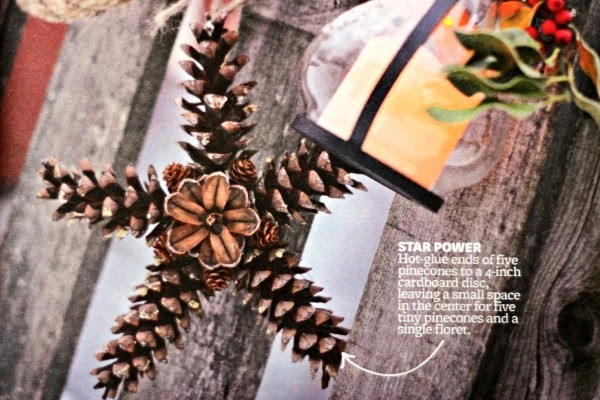 This simple outdoor tree with pinecone ornaments is just as charming as can be. Someday I'll make some fun pinecone stars for the tree, also. 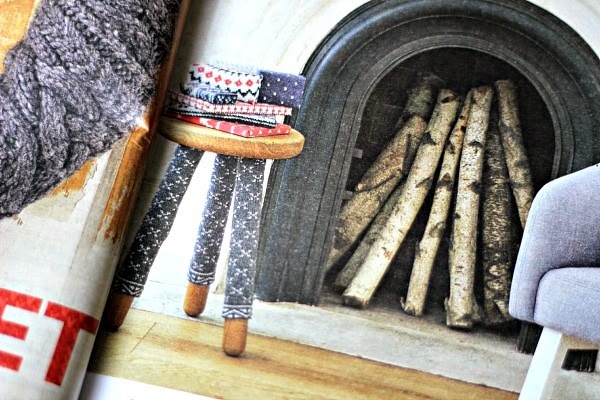 How cute are the little sweater leg warmers on this stool? 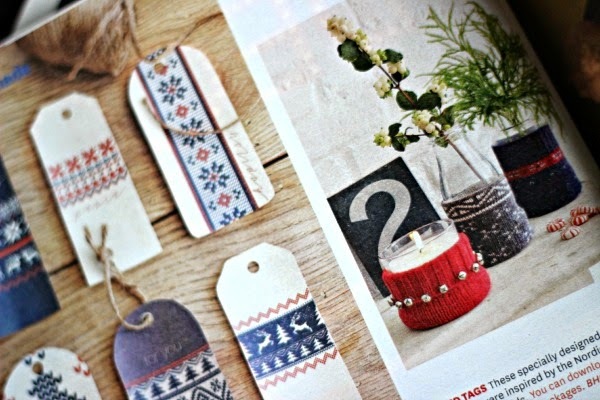 And the sweater cuff with jingle bell embellishments on that candle, so fun! That gives me a few more things to add to my thrifting list. I LOVE the chunky hardware added to this rustic planter. That would be such an easy DIY. Definitely remembering this one! 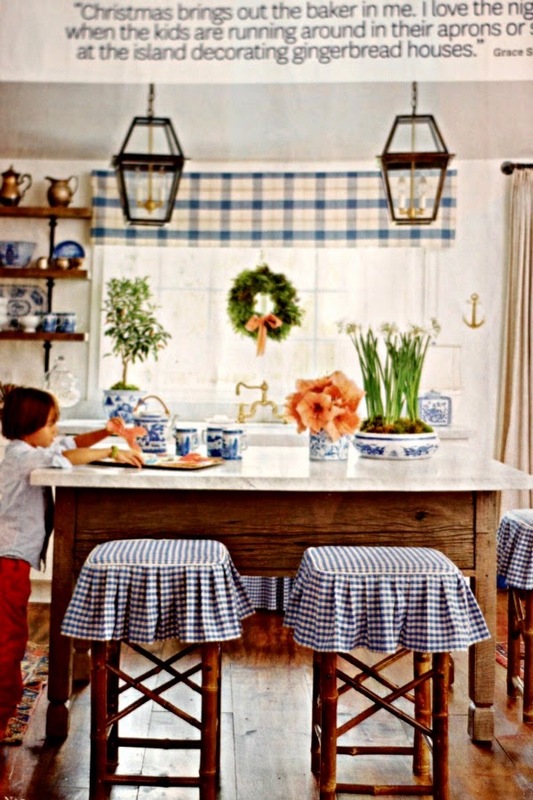 And can we just talk about this jaw-dropping gorgeous kitchen that belongs to Grace Sorensen? It's so, so good. A few other magazine photos inspired me this season. 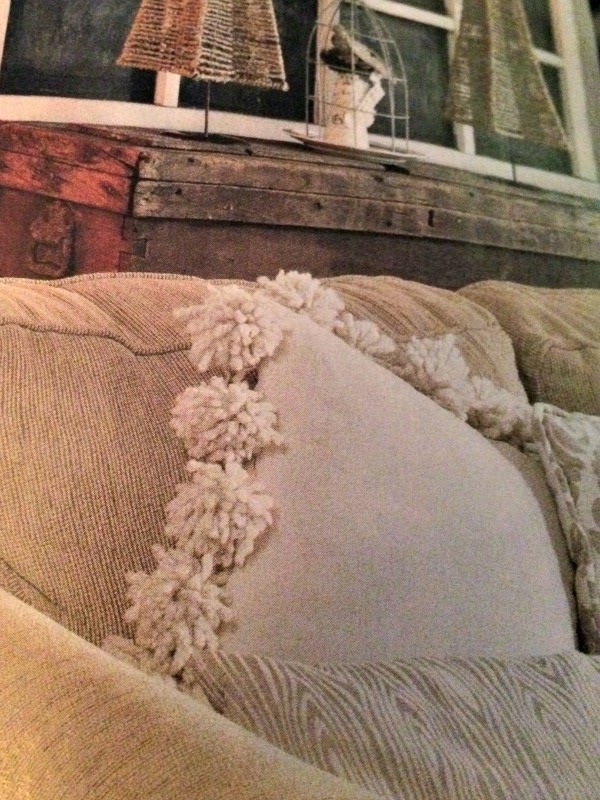 I snapped some pics on my phone while flipping through a few of my Mother-in-law's magazines so I'd remember the ideas. 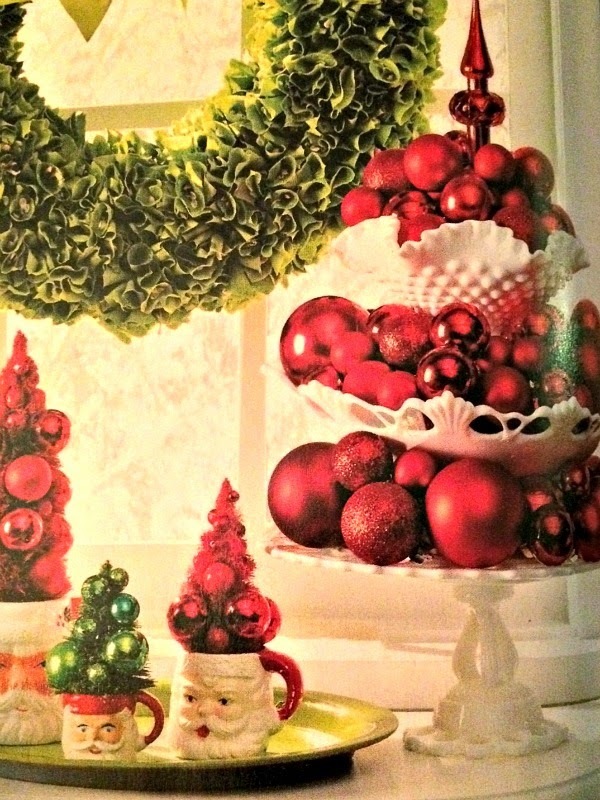 I believe these were from the BHG Christmas Ideas magazine, but feel free to correct me if I'm wrong! inspired me to do this in my kitchen. 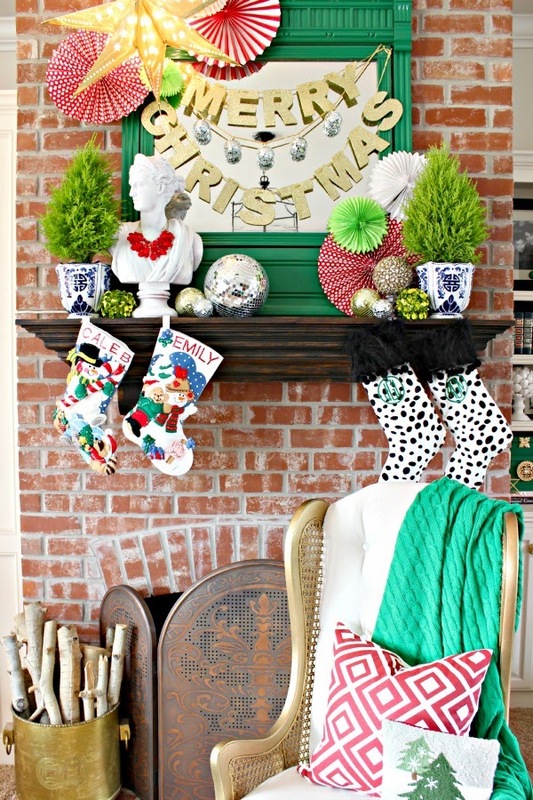 inspired me to use something similar on my Christmas Mantle. So where do YOU find inspiration? 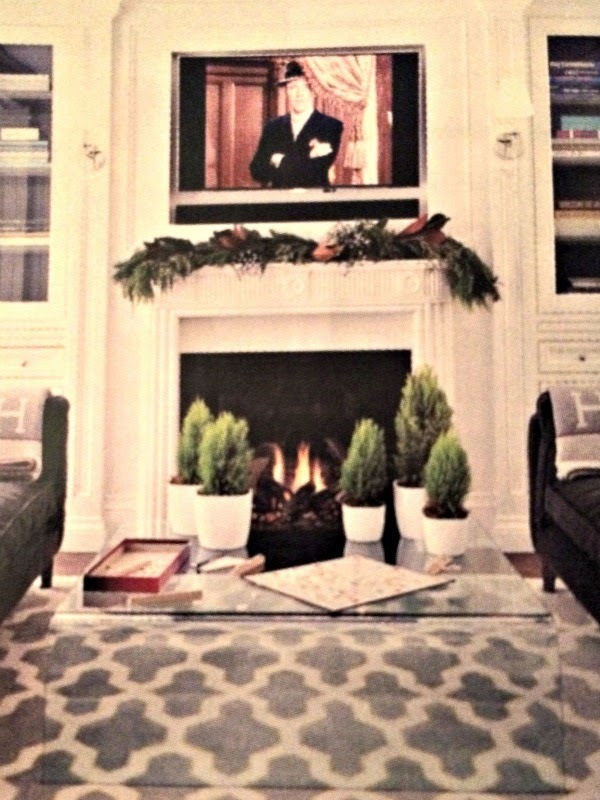 Have you gleaned any ideas from magazines to actually use in your own home? 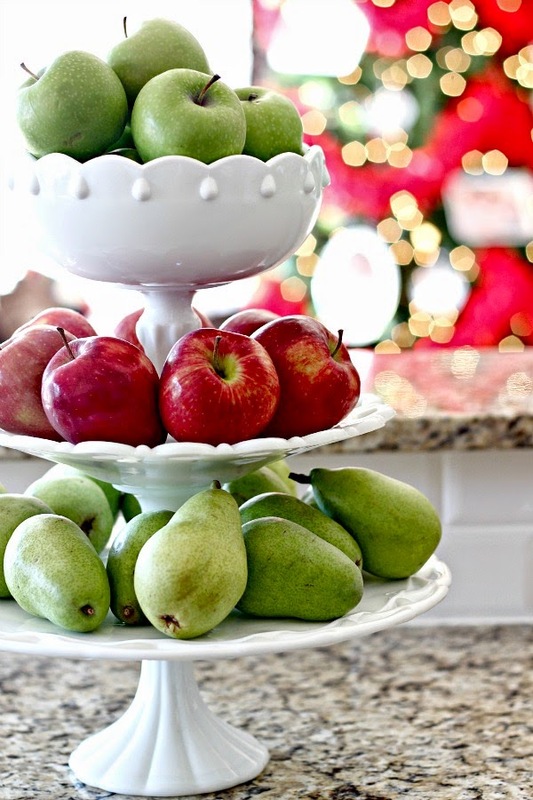 I love your decorating and I agree I was inspired when I read BHG too! I havent' checked out my latest issue since things have been a bit hectic for me, but now, I'm looking forward to it more than ever! 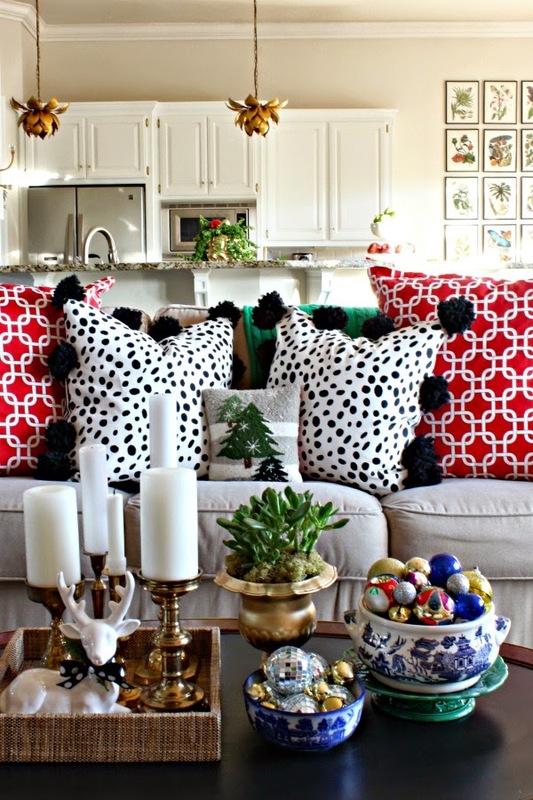 Love what you did with the milk glass, I have those pieces, I should copy that idea! :-) Have a nice day! 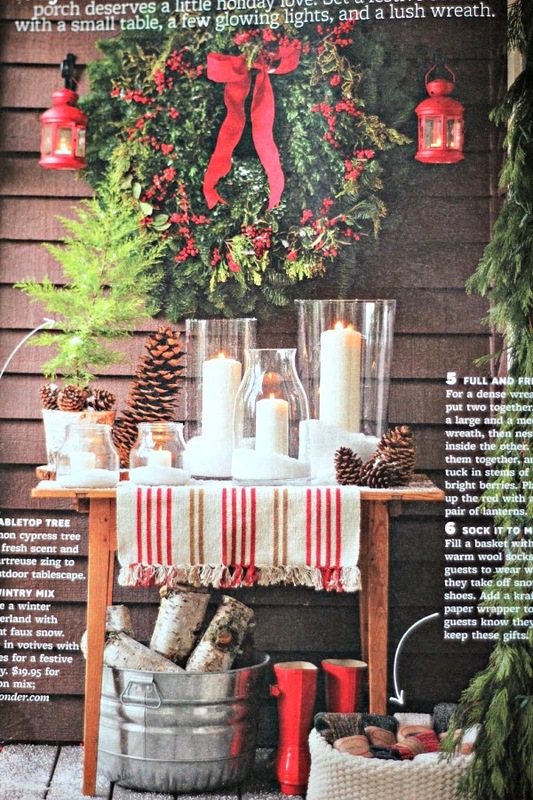 So is Grace's kitchen in the December 2014 BHG?? Yes! There's actually about a 10 page spread with several areas of her home. Absolutely stunning! Oh, I'm sure you have some fantastic ideas for next year Pam! What? You've had no time to sit around eating chocolates and looking at magazines? What in the world have you been doing? ;) ;) That little angel is growing already! Thanks Darrielle, it seems like BHG has been extra good lately! I'm so into the natural pinecone decor on the tree. I find inspiration in magazine too. 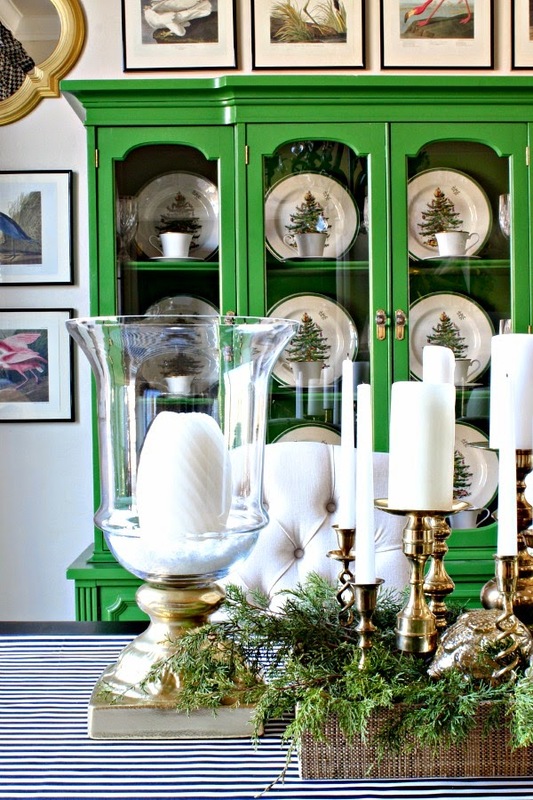 I have major envy every time I see your china cabinet...gorgeous! I love that issue too!! So many great ideas to use.